**I am participating in a Vibrant Influencer network campaign for Reddi-wip. I am receiving a fee for posting; however, the opinions expressed in this post are my own. I am in no way affiliated with Reddi-wip and do not earn a commission or percent of sales. If you have grandchildren, then you know that they all have different tastes and preferences. One thing they can all agree on is that all food tastes better with Reddi-wip on it. Summertime is the best time to enjoy Reddi-wip with berries. Although they may not always agree on what berries they want at any given time, berries and Reddi-wip are always a huge hit. What do grandchildren like? They like things they can call their own, things with their names on them. So this recipe calls for desert cups that you write your grandchild’s name on. Tip: Label your cups before you fill them. Then you layer the ingredients. As a base I chose brownie bits, but you can choose graham cracker or cookie bits. Whatever your grandchildren prefer. Then you layer vanilla pudding on top of the base. Mini colored marshmallows come next. Place your berries on top of the marshmallows. I chose strawberries because they are always a hit. 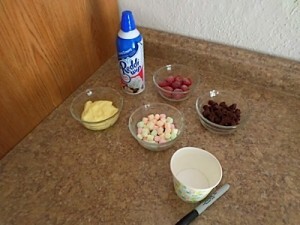 Top it all off with a good squirt of Reddi-wip topping and you have a desert everyone will love. You can alter this recipe in any way that suits your individual tastes. Did I mention that adults love Reddi-wip too? Why? It’s not just the great taste that they love. Did you know that Reddi-wip Original, Extra Creamy & Chocolate have only 15 calories per serving? If you go the fat-free route, it is only 5 calories. Reddi-wip is made with real dairy cream, never hydrogenated oils found in other whipped topping products. So you can serve up Reddi-wip to the grandchildren knowing you have made a good choice. 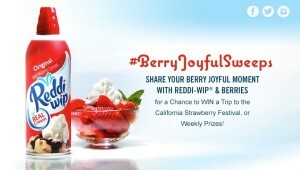 Now through July 7, 2014, consumers can share their everyday Reddi-wip® berry-licious moments on Twitter, Instagram or Facebook using the #BerryJoyfulSweeps hashtag for the chance to win a trip for two to the 2015 Watsonville Strawberry Festival, Reddi-wip coupons or berry keepers. A 15-calorie whoosh of real cream Reddi-wip® on berries makes everyday moments so berry joyful! Share, Tweet or Tag a pic with #BerryJoyfulSweeps for a chance to win the grand prize or weekly prizes! Check out the details for the sweepstakes and enter to win. You can find the store closest to you where you can purchase Reddi-wip using this locator. Let me add that pets love Reddi-whip too 😉 Every time I get some from the fridge, both the cat and the dog have come to expect a small squirt.